Vaccine researchers have been searching for ways to elicit antibodies against the stem region of the viral hemagglutinin protein, some of which are broadly cross-reactive. When vaccinated against H5N1 avian flu virus, volunteers' immune systems produced more anti-stem antibodies. Vaccine researchers have developed a strategy aimed at generating broadly cross-reactive antibodies against the influenza virus: embrace the unfamiliar. In recent years, researchers interested in a "universal flu vaccine" identified a region of the viral hemagglutinin protein called the stem or stalk, which doesn't mutate and change as much as other regions and could be the basis for a vaccine that is protective against a variety of flu strains. In an Emory Vaccine Center study, human volunteers immunized against the avian flu virus H5N1 readily developed antibodies against the stem region of the viral hemagglutinin protein. In contrast, those immunized with standard seasonal trivalent vaccines did not, instead developing most of their antibodies against the more variable head region. H5N1, regarded as a potential pandemic strain, is not currently circulating in the United States and the volunteers had not been exposed to it before. The results were published Monday, August 25 in Proceedings of the National Academy of Sciences. The key to having volunteers' bodies produce antibodies against the stem region seemed to be their immune systems' unfamiliarity with the H5N1 type of virus, says lead author Ali Ellebedy, PhD, postdoctoral fellow in the laboratory of Rafi Ahmed, PhD, director of Emory Vaccine Center and a Georgia Research Alliance Eminent Scholar. "Our previous research led us to hypothesize that immune responses to the stem region are likely to be stronger after exposure to hemagglutinin molecules derived from flu viruses which the human population has been minimally exposed to," Ellebedy says. The H5N1 immunization study was performed together with the Vaccine Center's Hope Clinic, directed by Mark Mulligan, MD, professor of medicine. Collaborators at University of Chicago and Mount Sinai School of Medicine contributed to the paper. 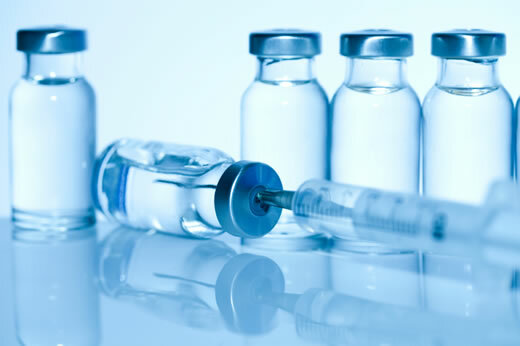 Emory Vaccine Center researchers had found that several patients infected with the 2009 H1N1 pandemic flu strain developed broadly cross-reactive antiviral antibodies. In 2009, most younger adults had never been exposed to the H1N1 pandemic strain and thus had no immune cells producing antibodies against it. But later, after that H1N1 strain started circulating widely in the population, it became part of the standard seasonal trivalent vaccine. When volunteers' immune responses to the seasonal vaccine were analyzed, most of the antibodies they generated reacted to the head region of hemagglutinin. Immune cells that produce antibodies against the stem region are widely prevalent in humans, but at low levels, the team found. But the standard trivalent seasonal vaccine tends not to amplify them. This led the team to ask whether vaccination with something different enough, such as H5N1, would stimulate production of "anti-stem" antibodies. "We had already performed a big H5N1 study back in 2008, so we went back and tested our hypothesis with some novel reagents that allowed us to dissect responses that are directed to the head vs. the stem regions," Ellebedy says. 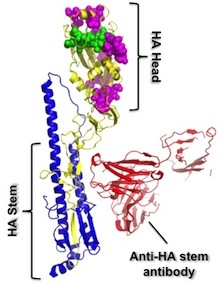 The team analyzed levels of antibody directed against different parts of the hemagglutinin protein in 17 volunteers, before and after H5N1 vaccination. Anti-stem antibody levels rose an average of four-fold after the first H5N1 vaccination. After a booster shot, however, anti-head responses dominated while anti-stem responses were feeble. "Our data indicate that most humans are capable of establishing a humoral immune memory that is specific to the conserved HA stem region...Overall, our data raise the important question of what would be the minimal 'concentration' of antistem antibodies required to provide in vivo protection. Therefore, it will be important in future studies to determine the quantity of HA stem-specific antibodies or memory B cells that would positively correlate with better clinical outcomes against influenza infections." "Our findings delineate a potential vaccination strategy where H5N1 or H7N9 immunization could be used not only for immunologically priming the population to quickly respond to serious pandemic influenza threats, but also for generating broadly neutralizing antibodies against influenza in humans." The research was supported by the National Institute of Allergy and Infectious Diseases (contracts HHSN266200700006C, HHSN26620070010C and HHSN272200800005C; grants 1P01AI097092, 1U19AI109946), the National Center for Advancing Translational Sciences (UL1TR000454), the Georgia Research Alliance and Children's Healthcare of Atlanta. Reference: A.H. Ellebedy et al. Inducation of broadly cross-reactive antibody responses to the influenza HA stem region following H5N1 vaccination in humans. PNAS Early Edition (2014).